A heartbreaking and mindbending story of a talented teenage artist's awakening to the brokenness of her family from critically acclaimed award-winner A.S. King. Sixteen-year-old Sarah can't draw. This is a problem, because as long as she can remember, she has "done the art." She thinks she's having an existential crisis. And she might be right; she does keep running into past and future versions of herself as she wanders the urban ruins of Philadelphia. Or maybe she's finally waking up to the tornado that is her family, the tornado that six years ago sent her once-beloved older brother flying across the country for a reason she can't quite recall. After decades of staying together "for the kids" and building a family on a foundation of lies and domestic violence, Sarah's parents have reached the end. Now Sarah must come to grips with years spent sleepwalking in the ruins of their toxic marriage. As Sarah herself often observes, nothing about her pain is remotely original--and yet it still hurts. Insightful, heartbreaking, and ultimately hopeful, this is a vivid portrait of abuse, survival, resurgence that will linger with readers long after the last page. Why Did I Listen To Still Life With Tornado by AS King? Still Life With Tornado by AS King basically hit my radar back in October 2016. Actually, I am excited I listened to it now instead of waiting like another four years. Regardless, I have really liked the majority of books that I’ve read by King. Her writing style is a little on the strange side where you sort of have to suspend reality and disbelief. It is the kind of writing style where there is a whole lot to delve into and unpack. Fortunately for those of you reading this review, I am not much of an unpacker so you won’t have to read me droning on and on about symbolism, but trust you can do that yourself. Anyways, I gave this one a shot because the other audiobooks I had planned on borrowing from the library were already taken out and I wanted something NOW not to wait on hold. So, Still Life With Tornado follows two main characters — Sarah and her mother Helen. Sarah is an artist who is on the verge of changing her name to Umbrella and dropping out of school after her art project is destroyed and no one will fess up or take it seriously. Sarah begins to see past and future iterations of herself. At first, she thinks they are hallucinations but it turns out other people can see those iterations too. Meanwhile we read flashbacks of a trip to Mexico leading up to why her brother Bruce currently isn’t in her life. Then there are scenes that are narrated by Helen and they delve into the relationship with Chet, Sarah’s father. This book explores the hidden realm of domestic abuse. What Did I Think Of Still Life With Tornado? 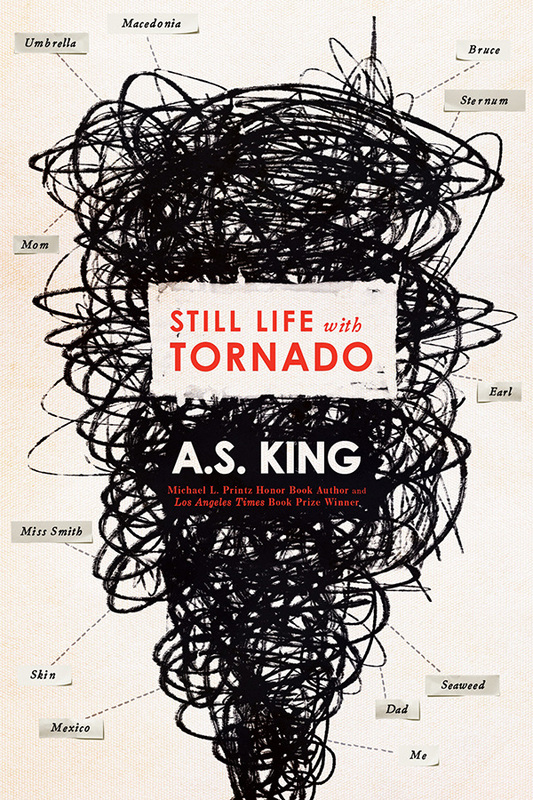 I think that Still Life With Tornado by AS King was an incredible book. Granted, there is a scene I still struggle with as a mom of a little. You see, Sarah and her mother are in the bathroom at a restaurant when a woman comes in and begins hitting her two year old child. That was really, really hard to read. However, I am sensitive to that right now and maybe you might not be. I liked how we slowly puzzle out everything that happens. We see why Bruce is gone, the true nature of the relationship between Helen and Chet, and who destroyed Sarah’s project. I think this is a really “smart” book. It shows just how much room there is for different kinds of writing in YA. The audiobook is narrated by Karissa Vacker. I am not sure if I’ve heard her narrate anything else before and don’t really have the motivation to go look. Regardless, she’s a decent narrator. I am glad it was an actual professional narrator over the author. I’ve listened to a book of King’s narrated by a professional and a book narrated by King herself. It is my preference after comparing the two and this book to listen to a professional narrator. Vacker’s reading kept my interest. She added a great level of quality to the audiobook. If you do end up reading this book, I think that audiobook is the way to go.